I've made up my mind to start meal prepping on weekends for the week ahead, but I don't know where to start. Can you give me a primer? Let someone else do the work for you! Buy pre-cut veggies in the freezer aisle. 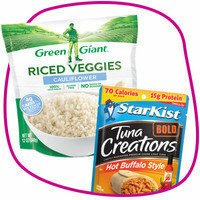 Green Giant has a great lineup of riced vegetables and steamable mixes. Stock up in advance, and you'll always be ready. Save even more time with precooked protein: fully cooked chicken sausage, StarKist tuna packets, and ready-to-eat chicken breast. Pssst... Here are SIXTEEN simple recipes made with precooked chicken! 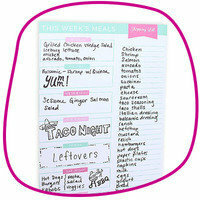 A grocery list is a given, but what you really need is a meal planner! I LOVE this cute magnetic one that hangs on your fridge. Write down your meals for the week before you go shopping. This way, you'll know exactly what you have and what you need. A digital scale is another great tool for meal prepping. Portion out ingredients for quick day-of assembly, or use it to accurately divide up make-ahead meals into single servings. Now it's time to get in the kitchen. 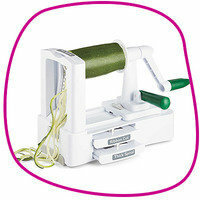 My favorite veggie prep tool is a spiralizer! A handheld one is great for small batches, but I'd recommend this tabletop spiralizer for serious meal preppers. For any chopping needs, I love these cutting boards; there's one for poultry, meat, fish, and veggies. Tightly seal up your pre-prepped goodies, and store them in the fridge. HG tip: Label them with dates, so you know their exact freshness level. Big-batch appliances like slow cookers are lifesavers. 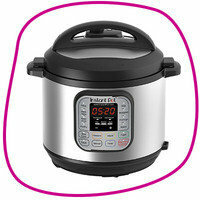 My newest favorite, though, is the Instant Pot… It's a slow cooker, a fast cooker (a.k.a. pressure cooker), and more! Look for other gadgets to make life easier. I'm obsessed with this Dash Rapid Egg Cooker. Hello, hard-boiled eggs in minutes! Great for sandwiches, snacks, and salads. Forget the single-compartment lunch boxes from your childhood. Containers have come a long way! Bento boxes are super handy... 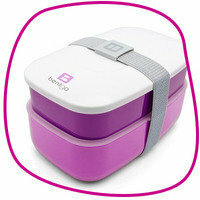 I love this stackable purple one! And this lunch box can fit an entire day's worth of food. For salads and overnight oats, grab a pack of mason jars. This Thermos Food Jar will keep yummy slow-cooker recipes warm for nine hours. Don't forget to label your containers with masking tape and markers so you know what's what! Get the most out of your meal prep by stocking your freezer. 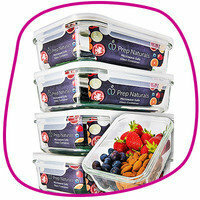 To freeze your meals, simply wrap individual servings (fully cooled), place in freezable containers, and seal. To thaw, transfer the food to the fridge the night before you plan to eat it. Then just reheat and eat. Or use the thaw setting on your microwave; remove any plastic wrap, and make sure the container is microwave safe! Get more meal-freezing advice here! Look at you, master meal prepper! HG News You Can Use! Holiday time = a sugarfest. Give yourself the gift of guilt-free goodies with Flex Flavors from Devotion Nutrition. These single-serve packets of stevia-sweetened deliciousness add calorie-free flavor to foods and drinks of all kinds! Try Creme Brulee in your oatmeal, Peanut Butter Crunch in your hot cocoa, Peach Cobbler in your yogurt... The possibilities are endless! Try the 30-packet sampler! It's December 6th, National Microwave Oven Day. Time to zap some Hungry Girl leftovers, and dig in all over again! Give your pals a hand… Share these tips with them now!